Replace the filter every 10,000 miles (15,000 km) or once a year. If the car is being driven in severe conditions such as dusty, rough roads, more frequent climate control air filter inspections and changes are required. 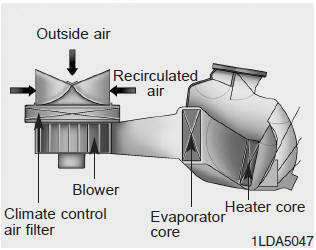 When the air flow rate is suddenly decreased, the system should be checked at an authorized dealer.